You are going to find that there are times when you still crave sugar. Great substitutes for sugar include stevia, xylitol, erythritol and………good healthy fats. Substituting fats for sugar is going to become your saving grace. As you start to break down your sugar craving you can feed your body and brain fat when you feel like eating something sweet. A tablespoon of almond butter, an avacado or a handful of walnuts can go a long way to creating new cravings for you. 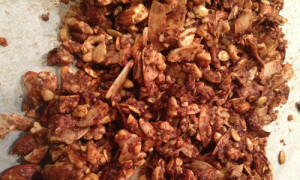 Combine nuts in a food processor and pulse several times to chop the nuts roughly. Transfer nuts to a large bowl. Pull out any large chunks and re-process. Add pumpkin seeds and coconut flakes to the nuts. Toss to combine then pour the oil mixture into the nut mixture and mix well. 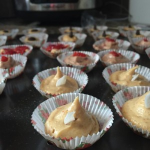 Whisk egg white and pour over mixture and combine with a spoon or your hands, making sure everything is coated well. Transfer granola onto baking sheet, spreading it out into one even layer. Bake granola for 20-25 minutes until dry and golden (watch it closely so it doesn’t burn). Don’t stir, but you may need to rotate the pan if it is growing unevenly. Remove the parchment from the hot pan and let the granola cool completely (it will get even crispier as it cools). When the granola is cool, break it up into chunks. This can be stored for up to two weeks in an airtight container. Serve with Almond milk, raw milk or coconut milk. Mix all ingredients in a blender. You may substitute berries (blueberries, blackberries, raspberries) for different flavors. Heat a pan on the stove, adding the butter. Once the butter has melted, add spinach and spices. Let the spinach begin to wilt. Once the spinach is almost completely wilted, add shredded cheese to the top and let it all melt together.